I've talked about this idea for years without realizing a lot of other people have too. 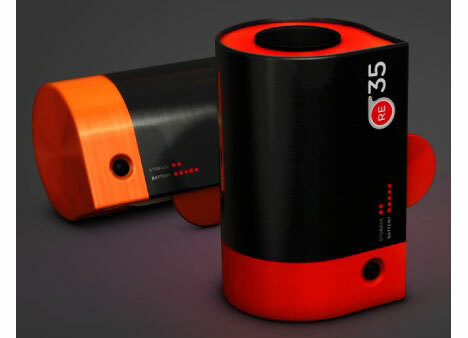 This April Fool's prank from Rogge & Pott called Re35 would be a way to use analog cameras and digital "film". In our house we have three great SLRs with at least a couple of lens that are collecting dust. I don't miss film or paper prints as much as I miss the great results my Minolta gave me with my favorite 28mm lens. The prank got so much attention, the firm is looking into its viability. I'm sure it couldn't exist in the form shown, but some kind of credit card-sized (or smaller) light sensitive film, connected to a tiny thumb drive in the shape of a film canister would be awesome. Maybe the sensor could even detect shutter advance or not and allow for manual light exposures. It could be a whole new form of photography blending analog and digital. I'll keep checking Kickstarter hoping to see something like this appear.